Why did Hashem exile the Jews to Bavel of all places? It is written that Hashem always tempers his anger with mercy. This ubiquitous crop of Bavel is loaded with a variety of vitamins, minerals, and natural sugars that boost energy levels and maintain vital functions of the body and the metabolism. They are relatively high in fatigue fighting carbohydrates, which convert quickly to fat if not used by the body for energy. Hashem designed this power package with perfectly chosen vitamins that help convert these carbs to fuel, making them readily accessible to the body’s engine rather than your hips. These are the B-complex vitamins: thiamine, riboflavin, niacin, vitamin B-6, and panthenoic acid. B vitamins are key in the production of hemoglobin, the red and white blood cells that benefit anemia sufferers. Nearly one third of the recommended daily allowance for iron is contained in a single serving. This serving can supply 14% of our body’s need for fiber to keep our digestive system running efficiently. Potassium is an essential mineral which is needed to maintain muscle contractions, a healthy nervous system and balance the body’s metabolism. Since it is not stored in the body and much is lost in perspiration, potassium must be continually replenished. Dates contain more potassium than bananas, are high in fructose, glucose and sucrose, relieve sugar cravings and boost energy. They are portable to boot. All this makes them perfect for snacking during exercise-- or while vigorously learning Torah! 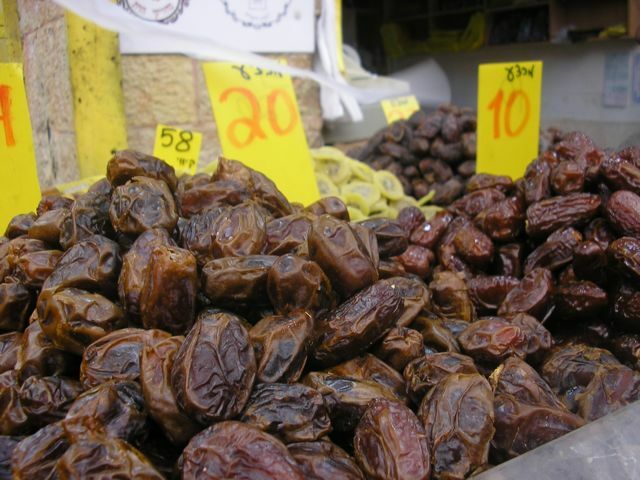 Here's a delicious recipe from Cooking for The King using dates. And a related Torah tidbit, too!